Ideas of global glaciations on the Earth repeatedly emerged in geology since the middle of the 19th century, but they all did not withstand the test of time. The hypothesis of snowball Earth that suggests long-lasted continuous glaciations over the entire land and oceans in the Late Riphean and Vendian became a popular topic of discussions worldwide. These glaciations must last continuously 15 million years or more owing to enormous stability of climate on the “White Earth,” and one can expect their cessation only when CO2 concentration in the atmosphere is getting by several orders of magnitude higher in the course of volcanic eruptions. However, many sections of the Late Precambrian glacial deposits evidence repeated alternations of glacial and interglacial events of variable rank and oscillations of glaciers. Consequently, liquid water existed on the Earth, hydrological cycle had not been interrupted, and development of phototrophic phytoplankton, the eukaryotic organisms inclusive, was always in progress. These facts and results of the climate mathematical simulation are inconsistent with the concept of long continuous glaciations over the globe and their consequences. Paleomagnetic data represent main starting point of the snowball Earth hypothesis, although they are to a great extent still of insufficient validity for the Precambrian. 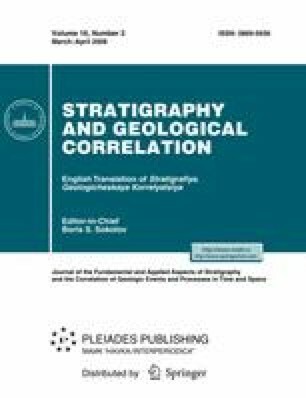 Equitable criticism of the hypothesis weak sides turns sometimes into denying all the glacial periods of the Late Proterozoic, when tillites are regarded in majority as deposits of subaqueous slumps and debris flows accumulated on walls of oceanic rifts prograding along splitting lines into the Rodinia continent. Doubtless marks of glaciations in the sedimentary succession are regarded therewith as heterochronous indications of local mountain glaciers on risen shoulders of prograding rifts. Widespread occurrence of the Late Precambrian discrete glacial horizons on the platforms means, however, that glaciations of that time have been associated not always with the rifts and consisted of separate glacial events. Glaciogenic horizons comparable in thickness and structure with those of the Phanerozoic Eonothem are also indicative of discrete glacial periods in the Precambrian. Being confined predominantly to the Late Precambrian succession of rifts, these horizons characterize a high burial potential of these structures, whereas outside them glacial horizons of lesser thickness could be easily subjected to erosion. The hypothesis of snowball Earth is inadequately consistent with well-known facts and needs in additional substantiation. There are also grounds to think that oceans have not been completely covered with ice at the time of Precambrian glaciations. Original Russian Text © N.M. Chumakov, 2008, published in Stratigrafiya. Geologicheskaya Korrelyatsiya, 2008, Vol. 16, No. 2, pp. 3–15.